In the same vein as 2013’s Getaway, we find 2014’s Drive Hard. Former racecar driver Peter Roberts (Thomas Jane) lives in Australia with his wife Tessa (Yesse Spence) and daughter Rebecca. Peter finds it tough to adjust to civilian life, as he clings to prior high-octane lifestyle and doesn’t feel “fulfilled” in his job as a driving instructor. Into this situation steps Simon Keller (John Cusack), a fellow American who claims to be in Australia for business. It turns out he knows a lot about Peter’s prior career and he kidnaps the driver for his own purposes. Simon stages a heist in which he makes off with $9 million in bonds – and implicates Peter in the job. This forces Peter to serve as getaway driver against his will, and we follow their adventures. That sounds like a pretty good set-up for the movie, so armed with that premise and a decent pair of leading actors, Drive Hard seems primed for success. Unfortunately, it flops, as virtually nothing about it becomes enjoyable or compelling. For a getaway/heist movie, Drive Hard feels awfully static – and chatty. Much of the story focuses on the conversations between Peter and Simon, and we also get plenty of yakkety-yak among many others. Some of that would be fine – and necessary, given how much exposition needs to occur – but the film focuses far too much on that side of things. No one goes to an action flick such as this just to hear the characters babble for 90 minutes. If the quality of the dialogue satisfied, I might not mind as much, but the lines tend to be silly and artificial. The film shoots for a sort of Tarantino-esque sense of wordplay, but it falls short of those goals and provides nothing more than relentless palaver. On the rare occasions Drive Hard actually attempts action, it flails as well. These scenes can’t bring much life to the film and seem flat and ordinary. While I don’t expect Fast and The Furious insanity from the flick, I’d like something at least vaguely exciting instead of this movie’s dull meandering. The only minor pleasures on display here come from Jane and Cusack. Neither man does especially well, as they tend to overact in their silly roles, but at least they show some life in this otherwise somnambulant affair. Even saddled with bad dialogue and goofy situations, they manage to provide decent chemistry. Perhaps Jane and Cusack will eventually reunite in a movie with a good script and competent direction. Drive Hard isn’t that film. Perplexing footnote: unless I missed it, the film never credits the young actor who plays Peter's daughter Rebecca. We get an insanely long list of every extra who appears but nothing for one of the flick's main characters? This seems bizarre - maybe those involved decided to protect the child by the removal of her name from this dud. Drive Hard appears in an aspect ratio of approximately 1.78:1 on this Blu-ray Disc. From start to finish, the transfer seemed strong. Sharpness looked good. No issues with softness occurred, as the movie remained tight and precise at all times. Jaggies and shimmering failed to distract, and edge haloes remained absent. The movie also lacked any source flaws and was consistently clean. In terms of colors, Drive Hard went with subdued tones, as the movie tended toward an amber feel; some blues cropped up as well and other shots gave us livelier hues. These looked appropriate and filled out well. Blacks were pretty deep, and shadows were well-depicted. The image offered a solid “A-” presentation. Given the subject matter, I expected a high-octane DTS-HD MA 5.1 soundtrack from Drive Hard. To my surprise, though, this became a bland mix. Rather than use the five channels to involve us in all the driving action, the soundscape maintained an odd focus on the front channels. In those speakers, we found reasonable stereo spread to the music and effects movement that seemed acceptable, if not especially engaging. While underwhelming, at least the forward domain added some life. In a perplexing move, the back speakers offered little involvement throughout the film. They threw out some ambience and general reinforcement of the front, but they seemed strangely passive. An action/car-oriented flick like this should bring us a dynamic soundscape, but that didn’t occur in the passive, bland mix heard here. Audio quality was fine. Speech appeared concise and intelligible, with no obvious issues. Music showed fair dimensionality, and effects displayed good clarity and accuracy. This wasn’t a terrible track, but it lacked the expected pizzazz. The disc opens with ads for The Numbers Station, Rage, Tomorrow You’re Gone and Odd Thomas. 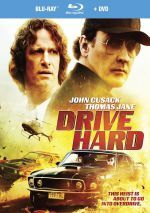 We also get a DVD copy of Drive Hard, but we find no movie-related extras on either platter.